While most people think Whiting & Davis when they spy an enameled and painted metal mesh handbag dating to the 1920s and ‘30s, a company owned by a Turkish immigrant named Sahatiel Mandalia made similar styles that also captivate collectors. In fact, some enthusiasts feel that Mandalian bags actually outshine Whiting & Davis’s product when they’re in excellent to mint condition. A photo caption in North Attleborough by By Bob Lanpher, Dorothea Donnelly and George Cunningham reports that Mandalia’s business, Mandalian Manufacturing Company, was housed in the Manufacturers’ Building in North Attleboro, Massachusetts in 1940. This was one of the many companies that competed with Whiting & Davis during the peak of enameled mesh handbag popularity. But Mandalia actually opened his business in 1898 making silver-plated handbags and jewelry, as Whiting & Davis also did at that time, so the competition began even earlier than you may have thought. When Mandalian closed in the early 1940s, Whiting & Davis acquired all of the company's mesh-making machinery, according to Handbags (Schiffer) by Roseann Ettinger. 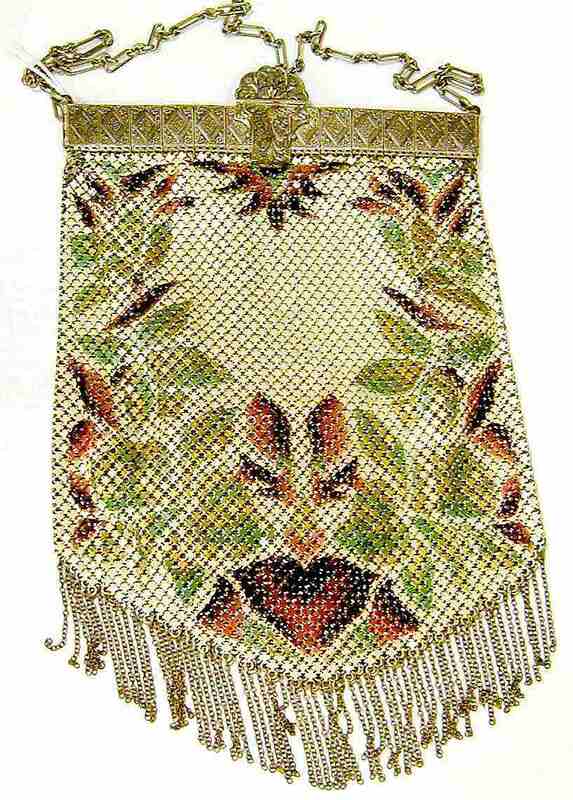 Whiting & Davis continued to produce more modern mesh handbags including all gold- or silver-tone versions with rhinestone clasps after the era of painted mesh subsided, along with other metal mesh products. Mandalian actually patented their “Lustro Pearl Finish” used on their metal mesh purses, and the pearlized enamel was guaranteed to be chip resistant, according to Ettinger. The colors used on these bags were vibrant and attractive, and many of the frames that held them were more elaborate than those of their competitors. It wasn’t unusual to find Mandalian bags incorporating intricate filigree frames or lavishly embellished frames with faux gemstones, and their original prices were steep, too. A variety of beautifully painted Mandalian bags with enameled metal beads dangling from the bottoms ranged from $4-30 each in an advertisement that ran in The Keystone in September of 1929. That’s the equivalent of $55-400 or so in modern terms. Mandalian bags were most often V-shaped and many of them had fine chain fringe embellishing the bottom edges. They were sold both with and without silk fabric linings, so if you find one sans lining it may have been made that way originally. Most bags that left the factory are marked Mandalian Mfg. Co. on the rigid metal frame. "Gloria" bags, like the one illustrating this feature, were usually not marked on the linked metal frames. Early Mandalian bags were marked with just a capital "M" inside a diamond, according to Sherry and Mike Miller of PurseCollector.com. While the metal mesh and paint on these bags usually holds up well, as promised with the chip resistant “Lustro Pearl Finish,” many are missing pieces of the chain fringe or metal dangling drops from the bottom edges. No matter how lovely the frame or body of the bag is, if there are missing components or other condition issues, antique purse enthusiasts will not pay top dollar to add these to collections. Collectors do sometimes overlook chipped and peeling paint on the metal dangling drops, however, because it didn’t generally hold up as well as the enamel on the mesh. This is especially true for a bag in a rare color or with a hard to find design. These high demand bags are usually a departure from the common florals. When bags are on the rare side, then minor condition issues become much more acceptable. If a bag originally had a silk lining and it has been removed, that impacts the value as well (although it’s sometimes hard to tell if a tattered lining has been removed, since the bags were produced with and without them as mentioned above). Links that have come unhinged in the corners of the frame can also lower the value, especially if the mesh is torn or connector links are missing.